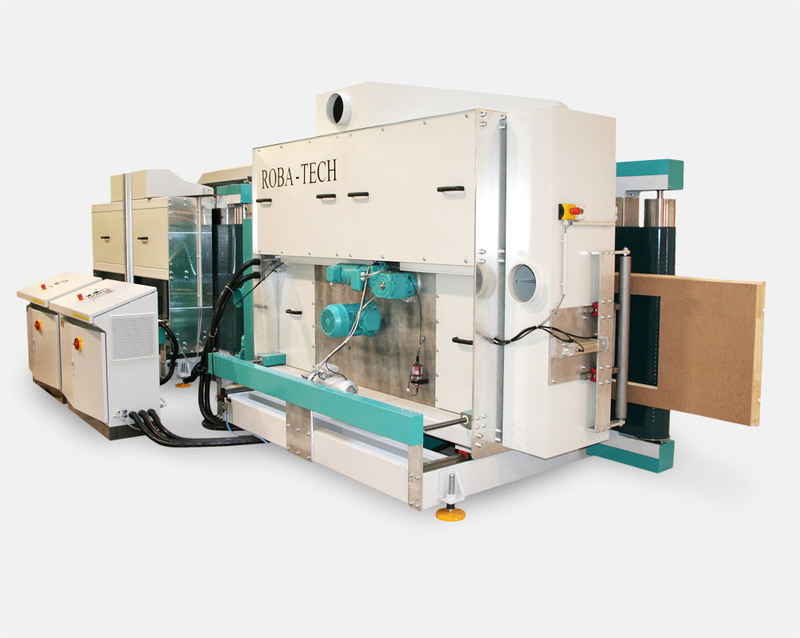 The patented Roba Tech principle is used for the sanding of flat and profile surfaced. Due to its innovative sanding method the Roba Tech offers for all these areas optimal prerequisites for best surface quality. 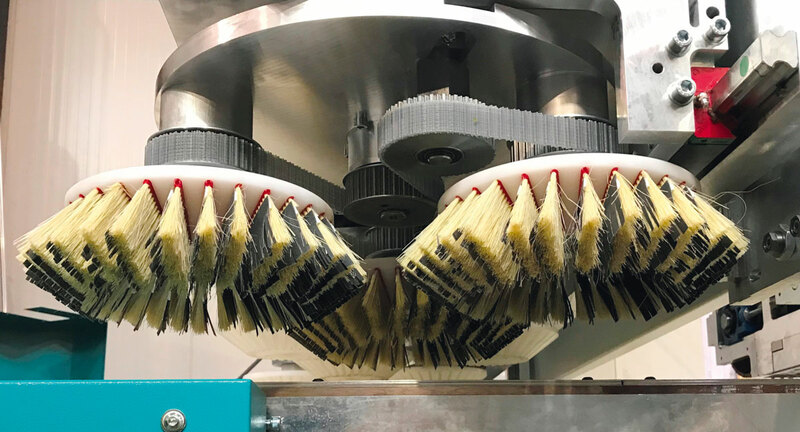 The main idea of the ROBA Tech principle is to avoid the main disadvantage of all today known drum based brush sanding machines: Those who work normally with sanding drum with a diameter of about 310 mm are only in a very small area in touch with the work piece, about 30 mm. Only in the vertex of the circle circumference of the tool a sanding process is possible. The innovative and patented ROBA Tech is equipped with a totally new developed sanding belt containing 174 sanding strips and provides a sanding area of approx. 1300 x 1500 mm in touch with the workpiece and more than 250 meters of sanding material on all aggregates. This is unique on the market of brush sanding machines. A 360 ° rotation of the sanding aggregate over the work piece makes it possible to reach all edges and corners of a workpiece. New is the reinforced disk unit, which now can also be used for light structuring and calibration work. 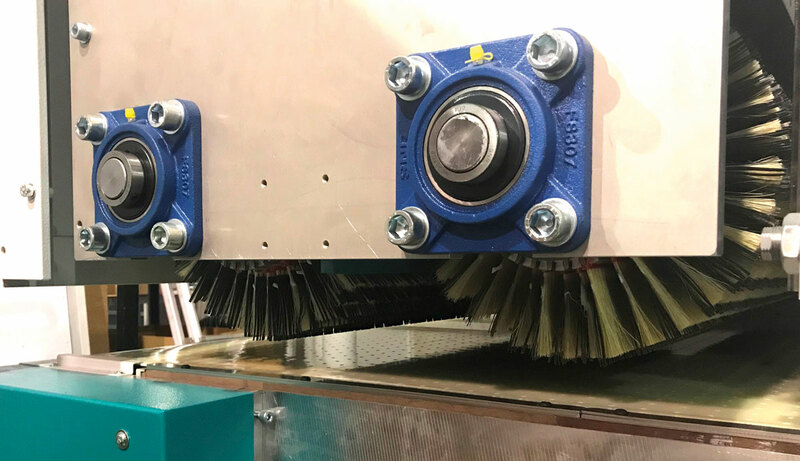 For this purpose it is placed at the inlet of the machine and adapted to this task by the use of special disc tools: Discs with steel wires are used for texturing, being able to perform regardless of the grain direction of the wood. The plain Micron discs are used to sand flat surfaces and create a chaotic sanding pattern that can be easily covered by a topcoat. Conical discs make it easier to sand part edges and V-shaped groves, allowing the sanding tool a better reach of the milled contours. 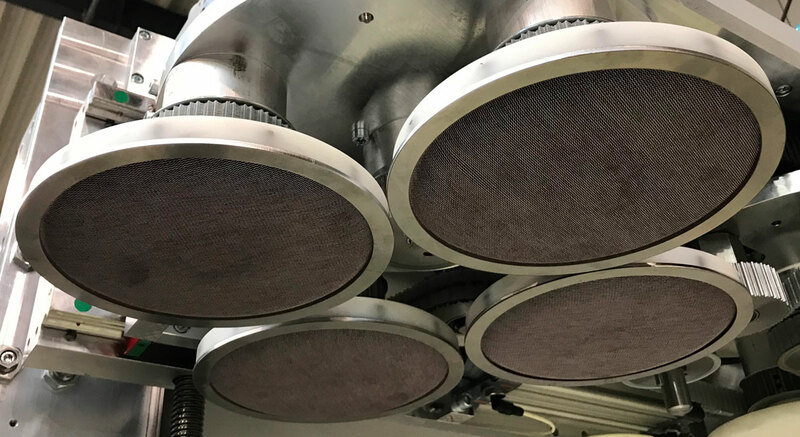 In order to use Micron or conical discs, it makes sense to install the disk unit at the machine inlet. The subsequent efficient ROBA Tech sanding belt takes over the final fine work. Many by PLC adjustable sanding options help the operator to set the machine to his special sanding requirements. Large abrasives quantities make low movement speeds possible, at better effectiveness. The rotational sanding head with a large sanding area ensures a consistent sanding in all work piece areas. Free PLC programmable sanding parameter to optimize results. A perfected vacuum system guarantees that even drawers can be transported safely. A “pulling” sanding avoids wavy surfaces and penetrates deeply into the milled grooves. The low sanding speed guarantees long abrasive lifespan because the sanding segments do not hit the work piece edges that hard. Optional aggregates that use the Micron, texturing or conical discs optimize the result.